The unique character and allure of Dubai has seen the city become the epicentre of tourism in the United Arab Emirates. Dubai is home to some of the world's most spectacular man-made sights, with its skyscrapers being amongst the highest in existence, and its palm-shaped islands boasting literally miles of white sandy beachfronts and entertainment options. Sunshine is always guaranteed in Dubai and this desert city is today something of an Arabian oasis. Tourists will find that the main areas of interest are Bur Dubai, Deira, Jumeirah and Sheikh Zayed Road, each of which is home to various tourist information outlets, operated by the city's very own Department of Tourism and Commerce Marketing. 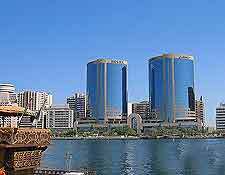 Bur Dubai incorporates the historical Bastakiya (Bastakia) area, while Deira is a good place to come for traditional markets (souks / souqs), and Jumeirah for beaches and luxury resorts. Sheikh Zayed Road is where you will find the main exhibition centre and a good choice of business accommodation and restaurants. 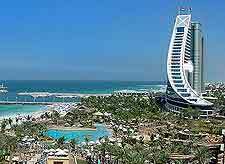 There is no denying that Dubai has become a very lively and exciting city, and its endless array of tourist attractions certainly match that image and persona. Visitors will be able to enjoy everything from desert safaris onboard either a 4X4 jeep or a camel, cruises around the Dubai Creek, surfing at the Wild Wadi Water Park, and bargains at the vibrant souks. If the Arabian sunshine is proving a little too hot for comfort, you can even cool down by skiing at the Ski Dubai attraction, which resides within the simply enormous Mall of the Emirates and is amongst the biggest indoor ski resorts in existence, with actual snow being produced each night. 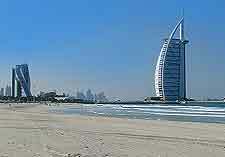 More information about Dubai Tourist Attractions. The city's skyline is simply awesome and what most people think of when they picture Dubai and its spectacular towering skyscrapers. Currently the tallest building in the whole world, the Burj Al Arab Dubai is certainly one skyscraper that is hard to miss and rather resembles a rocket in its shape. For something a little more historic, head to the district of Bastakiya (Bastakia), where tourists can actually experience the pre-oil lifestyle of the city. There are also many mosques that add a different character to the city, with both the Grand Mosque and the Jumeirah Mosque being amongst the most beautiful and impressive. More information about Dubai Landmarks and Monuments. Although the city is certainly not overflowing with museums, there are a number on hand should you be looking for historical information and artefacts from bygone years. The culture and past of the city is explored within the Dubai Museum at the Al Fahidi Fort, with the neighbouring Narish Khyma Museum often being visited as well. Further museums and similar cultural attractions are to be found next door, in the nearby city and emirate of Sharjah. More information about Dubai Museums and Dubai Art Galleries. The allure of nearby cities is often enough to persuade many tourists to consider a day trip or two, with Dubai being right next to the ever-changing scenery along the East Coast. 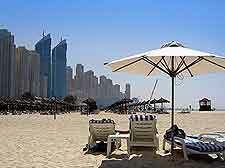 Particularly close by is the emirate of Ajman, where the Ajman Beach is much frequented and a good place to enjoy a spot of dolphin watching. Mina Jebel Ali lies to the south-west and features a very natural-appearing beachfront and huge man-made harbour, while Abu Dhabi is perhaps the most popular of all the possible excursions and home to fortresses, mosques, palaces and a glorious seaside promenade known as the 'Corniche'. More information about Dubai Attractions Nearby.